Dance your way to a night of absolute fun when you adorn yourself with this Graceful Gala Coral Short Party Wear Tunic with Handwork, a Snehal Creation piece. 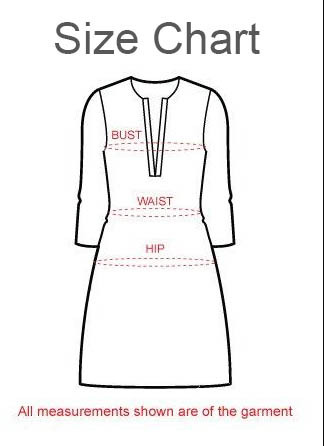 This A-line tunic is designed to have a simple round neck and three quarter sleeves. Heavy gotapatti hand work spans itself on the upper half of the bodice around neck line and is a stunner, while taping at the sleeves is provided by gotapatti. Answer: Fabric is Faux Crepe. It is written there.